Located wholly within the Sunshine State, Interstate 4 comprises a southwest to northeast route across the Florida peninsula. 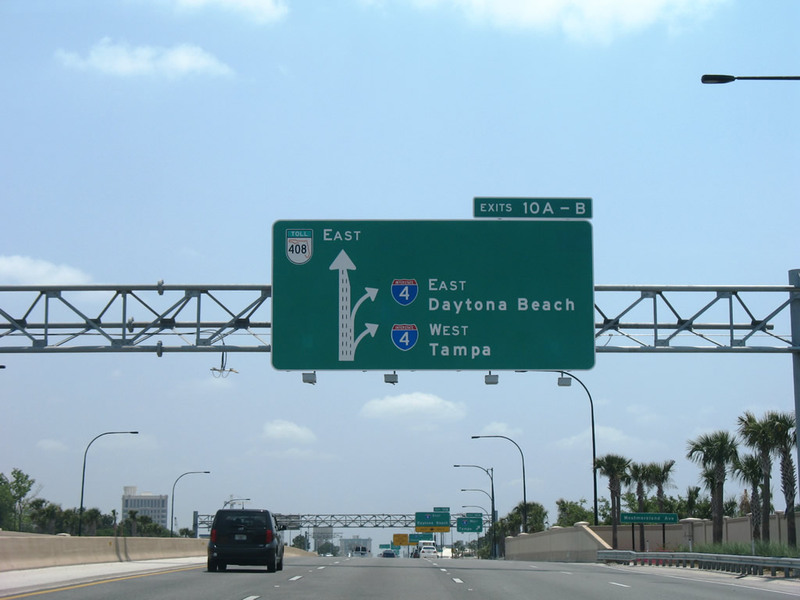 The freeway connects the metropolitan areas of Tampa-St. Petersburg, Lakeland-Winter Haven, Orlando and Daytona Beach. With the ever expanding population and development in the state, I-4 is a major transportation corridor that was inadequate at its original four lanes. Various construction programs completed between the mid 1990s and 2008 improved the capacity of the route between Tampa and Orlando, with six-lane expansion through Volusia County finished in spring 2017. The entire length of Interstate 4 doubles as State Road 400. SR 400 extends east as a stand alone route from the freeway end at I-95 to U.S. 1 along the Daytona Beach and South Daytona city line. The XPress 400 toll plan related to the SR 400 numbering of I-4. Through Orange and Seminole Counties along with the city of Orlando, a variety of improvements were proposed, most of which were controversial. In October 2003, the “Mobility 20/20” tax plan proposed an expanded Interstate 4 through the metropolitan area, but that was rejected by voters. One of the reasons cited for the failure of this tax was opposition to toll lanes on I-4. Nevertheless, the idea returned in March 2005. 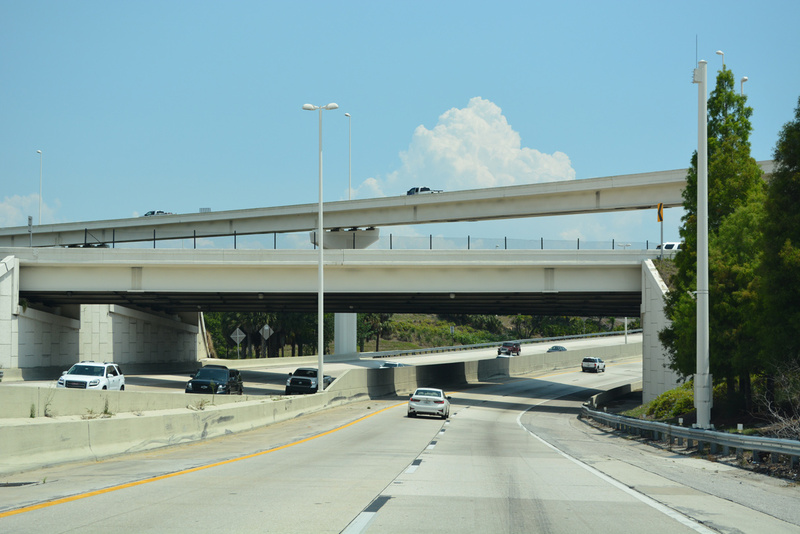 The Trans4mation project resulted in some improvements to area interchanges, such as the building of a new flyover from I-4 west to John Young Parkway and completion of Phase 1 of the I-4 and SR 408 (East West Expressway) interchange upgrade. The remainder of work is now apart of the I-4 Ultimate Project. The current initiative focuses on 21 miles of Interstate 4, from south of SR 435 (Kirkman Road) in Orange County to north of SR 434 in Seminole County. The $2.3-billion project kicked off in early 2015 and runs through early 2021. Work rebuilds 15 interchanges, replaces 75 bridges and adds four Express Lanes along the median of I-4. Interstate 4 parallels U.S. 92 eastward from Tampa to Lakeland, with the two running close by through Mango and Plant City. Where I-4 shifts northeast, U.S. 92 stays east, leaving the freeway for Auburndale, Winter Haven and Haines City. U.S. 92 turns north at Haines City along an overlap with U.S. 17 to Kissimmee, but staying somewhat distant from I-4. U.S. 441 combines with the pair from Kissimmee through Orlando along Orange Blossom Trail, which converges with the I-4 corridor southwest of Downtown Orlando. U.S. 441 branches northwest to Apopka at the U.S. 17 & 92 eastern turn onto Colonial Drive ahead of I-4. The pair extend northward to Maitland, Casselberry and Lake Mary to cross paths with I-4 again at Sanford. U.S. 17 parts ways with U.S. 92 and the I-4 vicinity at DeLand for Palatka while U.S. 92 turns east through Tomoka Wildlife Management Area. Two wye interchanges and a connector join I-4 and U.S. 92 to the west of their respective interchanges with I-95 at Daytona Beach. As originally planned, Interstate 4 continued southwest on what is now Interstate 275 from its western terminus across the Howard Frankland Bridge into St. Petersburg. 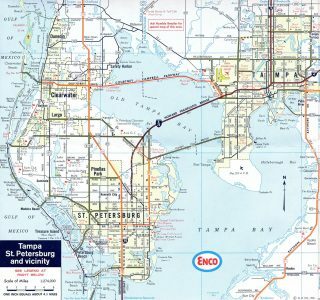 Some plans extended Interstate 4 further west from Downtown St. Pete to the Gulf of Mexico, but these plans never came to fruition. The extension of Interstate 75 south to Fort Myers and Naples in 1971 replaced Interstate 4 west from the Downtown Interchange in Tampa to Pinellas County. The 1971 General Drafting Map of Florida shows the Howard Frankland Bridge co-signed as Interstate 4 and Interstate 75; by 1973, the bridge was shown as Interstate 275, with Interstate 75 rerouted onto a new alignment east of Tampa. 1960 – Interstate 4 opened along (1) the Howard Frankland Bridge, (2) from East Tampa east to Lakeland, and (3) from Lake Monroe to near Lake Helen. 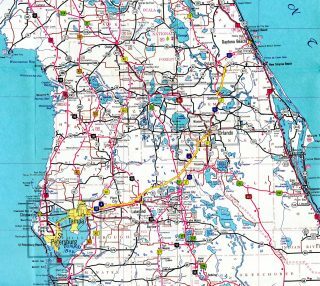 Proposed (as yet unconstructed) sections that year on Interstate 4 included those in St. Petersburg, in Tampa, from Lakeland to Orlando, and from Lake Helen to Tiger Bay State Forest. 1961 – Interstate 4 opened from Lakeland to Orlando and under construction from Lake Helen east to Daytona Beach. Sections still unconstructed and proposed included segments in St. Petersburg, in Tampa, and from Orlando to Sanford. 1963 – The only section of Interstate 4 in Tampa that had still not yet built was between Armenia and 22nd Street. 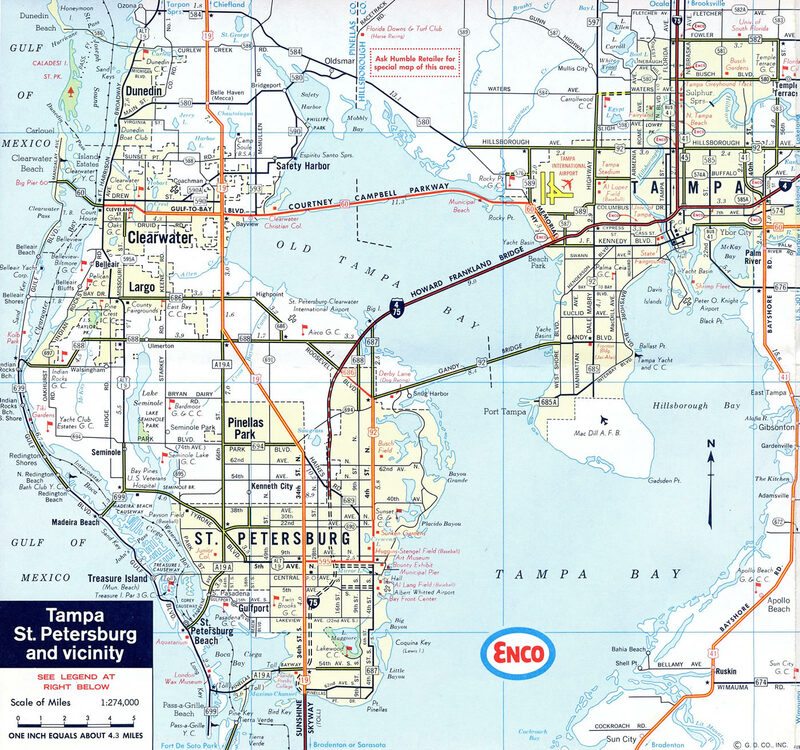 1969 – Interstate 75 extended south, sharing an alignment with Interstate 4 from Tampa southwest to St. Petersburg. 1971 – Beginning of Interstate 4 truncated to the Downtown Interchange with Interstate 75 (renumbered Interstate 275 in 1973) in Tampa. Interstate 4 now complete from Interstate 275 in Tampa to Interstate 95 in Daytona Beach. Florida 408 (East-West Expressway) eastbound on the approach to Interstate 4 (Exit 10) in Orlando. 2008-opened ramps to Interstate 4 replaced a turnpike style trumpet-to-trumpet connection. Photo taken 05/16/08. The exchange between Interstate 4 and SR 408 (East-West Expressway) is one of the busiest along the 132-mile freeway. The Ultimate I-4 project will complete the redesign of the exchange into a high-speed interchange. Interstate 75 was extended south to Naples in 1971, replacing the western most stretch of I-4 from the Downtown Interchange in Tampa to St. Petersburg in Pinellas County. While in the transition period that year, General Drafting opted to show both routes as cosigned across the Howard Frankland Bridge. The 1963 Florida Official Highway Map shows that the bulk of Interstate 4 was already open to traffic. The freeway was completed northward to Robinson Street (SR 526) that year. The mainline of Interstate 4 was eventually completed in 1966. Interstate 275 passes below ramps with I-4 at the Downtown Interchange in Tampa. Photo taken 04/26/16. Several toll roads have been constructed to provide an alternate to Interstate 4 and commuter routes throughout Central Florida. Some of these routes include the Lee Roy Selmon Expressway (SR 618) at Tampa; the Polk Parkway (SR 570) around Lakeland; the Central Florida GreeneWay (SR 417) around the east side of Orlando and the Daniel Webster Western Beltway (SR 429) around the west side of Orlando. The Wekiva Parkway (SR 429), extending the Western Beltway north from Apopka to Sanford, is currently under construction. Widening of the 12.34 mile section of Interstate 4 from SR 44 east to I-95 was completed in spring 2017. The $143.0 million project expanded what was the last four-lane stretch of I-4 in the state.3 Photo taken 05/24/17. A series of guide signs installed along the approach to Interstate 95 (Exits 132A/B) reference the end of I-4 and the eastern extent of SR 400 to South Daytona. Photo taken 05/24/17. Reconstruction of the systems interchange linking Interstates 4 and 95 with SR 400 (Beville Road) east through summer 2018 shifts all traffic bound for Interstate to the left. Upon completion, two lanes will continue onto a new collector distributor roadway to I-95 at U.S. 92 (International Speedway Boulevard). Photo taken 05/24/17. An end Interstate 4 shield stands along the transition ramp from I-4 east to I-95 north. Photo taken 05/24/17. A new two-lane roadway under construction replaces the single lane separation for I-95 south (Exit 132B) and Florida 400 (Beville Road) east. The ramp for Miami will pass below this roadway, having departed from the expanded northbound ramp to I-95 on the left. The interchange upgrade is part of a $205.0 million project widening 13.85 miles of Interstate 95 in Volusia County.4 Photo taken 05/24/17. A second end shield formally concludes the freeway ahead of a service station and Andros Isles Boulevard. Florida 400 extends east 4.2 miles to U.S. 1 (Ridgewood Avenue) at South Daytona. Connecting roads (CR 4009 and SR 483) serve interests to Daytona International Speedway, Daytona International Airport (DAB) and Embry-Riddle Aeronautical University. Photo taken 05/24/17. A ground level end sign was posted 1.5 miles ahead of the freeway transition to Florida 400 (Beville Boulevard). This assembly was removed during widening of I-4 to six lanes. Photo taken 07/27/13. A single lane left-hand ramp, originally striped for two lanes, joined Interstate 95 north to St. Augustine, Jacksonville and points north. The mainline continued to I-95 south and SR 400 east. Photo taken 07/27/13. Continuing east along Interstate 4, the right-hand lane defaulted onto I-95 south to the Space Coast, Fort Lauderdale and Miami while the left-hand lane extended east as Exit 132 to Beville Boulevard and South Daytona. Photo taken 07/27/13. Additional photos of I-4 east on the approach to I-95 posted at Interstate 4 East – Volusia County on AARoads. Photos showing the older guide signs and the two-lane configuration for I-4 east to I-95 north posted at Interstate 4 West – Archive. Pre-construction look of I-95 south ahead the wye interchange (Exit 260B) with Interstate 4 west for Orlando. A three-quarter cloverleaf interchange joined the freeway end and Beville Boulevard (Florida 400 to the east) at Exit 260A. Photo taken 01/03/14. Two lanes connect Interstate 95 south for I-4 west to DeLand, Deltona, Sanford and Orlando. This ramp was be relocated westward to depart from a collector distributor roadway built to eliminate weaving traffic between U.S. 92 and Interstate 4. Photo taken 01/03/14. An end shield for I-95 appeared along the off-ramp from I-95 south to I-4 west. This sign catered to tourist traffic bound for the Orlando resort area, as Interstate 95 does not conclude for another 260 miles south in Miami. Photo taken by Daniel Davis (06/08/03). Interstate 95 south at Interstate 4 when the sequential based exit numbering system was still in use. Photo taken by Garrett Hayman (11/02). Interstate 95 north reached Exit 260A for the continuation of State Road 400 east from the I-4 freeway end to South Daytona. Exits 260A/B will be relocated from the I-95 mainline to a new c/d roadway during the systems interchange reconstruction through summer 2018. Photo taken 02/23/14. More photos showing I-95 north at I-4 and SR 400 posted at Interstate 95 North – Volusia County. Florida 400 (Beville Road) constitutes an arterial route west from South Daytona to the beginning of Interstate 4. Pictured here is the former northbound on-ramp to I-95, which was replaced by a new ramp departing further east to the future c/d roadway north to U.S. 92. Photo taken 05/24/17. Both roadways linking SR 400 with I-4 will be rebuilt and moved to new alignments. The loop ramp for I-95 south will be replaced by a left-hand ramp, with four lanes passing over Interstate 95 on a new overpass. Photo taken 05/24/17. An end sign for Interstate 4 was added to the freeway in 2006. The freeway through Tampa and the Ybor city area was completely rebuilt utilizing a larger foot print with a wide grassy median reserved for tolled Express Lanes or light rail. Photo taken 03/23/14. The four lanes of Interstate 4 west separate into three movements at the Downtown Interchange. Exit 45A joins a distributor roadway along I-275 south to Jefferson Street and Ashley Drive into Downtown Tampa. A separate flyover was built for this ramp during 2002-06 reconstruction of the three-wye interchange. Photo taken 03/23/14. Common traffic congestion due to the bottleneck of Interstate 275 from six to four lanes bleeds onto Interstate 4 west at the Downtown Interchange. I-275 leads through north Tampa by the University of South Florida (USF) campus to Lutz and I-75 at Wesley Chapel. Photo taken 03/23/14. The former configuration of I-4 west on its final mile. Interstate 275 makes a 90-degree turn at the forthcoming Downtown Interchange. Coming from the west near Tampa International Airport (TPA), I-275 turns due north at I-4, en route to Interstate 75 and Ocala. Photo taken by Justin Cozart (12/02). Westbound Interstate 4 at Interstate 275; this was the last series of sign bridges. The busy interchange was reconstructed from October 27, 2002 to December 22, 2006. Exit 26 (now Exit 45A) for Downtown – East Jefferson Street referred to the first southbound ramp of I-275. Picture taken by Gene Janczynskyi (10/25/00). Full coverage of Interstate 4 west posted at Interstate 4 West – Hillsborough County on AARoads. More historical photos showing the older Downtown Interchange configuration and signs at Interstate 4 West – Archive. Interstate 275 travels a series of a viaducts north of Downtown Tampa to the Downtown Interchange with Interstate 4 east (Exit 45B). Photo taken 07/10/11. I-275 north reduces to three through lanes below the flyovers with I-4 as Exit 45B departs for Ybor City, Lakeland and Orlando. Photo taken 12/23/15. The flyover for Interstate 4 east (Exit 46B) departs in a half mile just beyond the Floribraska Avenue off-ramp (Exit 46A). Photo taken 04/25/16. One mile traffic backups occur regularly along I-275 south from SR 574 (Dr. Martin Luther King, Jr. Boulevard) to the single lane ramp for I-4 east. Photo taken 03/23/14. A distributor roadway (Exit 45A) departs I-275 south for the Tampa central business district as the mainline reduces to two through lanes at the Downtown Interchange. Interstate 4 maintains six to eight overall lanes east from Ybor City nearby nine mile to I-75 near Mango. Photo taken 03/23/14. Two miles north of the Downtown Interchange, this former guide sign referenced the I-4 east connection with I-75 south to Naples. Picture taken by Gene Janczynskyi (10/25/00). Interstate 275 south reduces to two lanes through the Downtown Interchange with I-4 east. Picture taken by Gene Janczynskyi (10/25/00). “Toll idea advances despite opposition,” by Scott Powers, Orlando Sentinel; March 16, 2005; page A-1. 408464-1 I-4 Widening from SR 44 (East New York Avenue) to East of I-95. CFLRoads, FDOT project web site. 242715-2 I-95 Widening and Systems Interchange Reconstruction Design-Build from North of SR 44 to North of US 92. CFLRoads, FDOT project web site. Page updated March 20, 2018.